You would think investors (muppets) would be grateful for the extended topping process of the stock market, as it has given them the opportunity to exit before the inevitable crash. As CNBC and the rest of the mainstream media spin bullish stories to keep the few remaining mom and pop investors sedated and the millions of passive working Americans invested in their 401ks, the Wall Street rigging machine siphons off billions in ill-gotten gains, while absconding with fees for worthless advice. Does the average schmuck know the S&P 500 stood at 2,063 on November 21, 2014 and currently sits at 2,056, thirteen months later? Based on the media narrative, we are still in the midst of a raging bull market. John Hussman provides the counterpoint to this narrative with unequivocal factual evidence based upon a hundred years of stock market data and valuations. Anyone investing in today’s market should expect ZERO returns over the next ten years and a 40% to 55% plunge in the near future. And as a cherry on top, a recession has arrived. The summary of this outlook is straightforward. I view the equity market as being in the late-stage top formation of the third financial bubble in 15 years. Based on a century of evidence relating the most historically reliable valuation measures to actual subsequent market returns, neither a market plunge of 40-55% over the completion of the current cycle, nor the expectation of zero 10-12 year S&P 500 nominal total returns, nor the likelihood of substantially negative 10-12 year real returns should be viewed as worst-case scenarios – they are all actually run-of-the-mill expectations from current extremes. Based on the joint behavior of the most reliable leading economic measures (particularly new orders plus order backlogs, minus inventories), widening credit spreads, and clearly deteriorating market internals, our economic outlook has also moved to a guarded expectation of a U.S. recession. The Federal Reserve has encouraged the rampant speculation over the last few years with their trillions in QE gift to Wall Street banks and ZIRP, which allowed the “brilliant” 30 year old Ivy League educated high frequency traders to take the free Fed money and front run their client’s trades and generate guaranteed profits. Of course, ZIRP also forced grandmas throughout the country to acquire a taste for cat food in order to survive. But Ben and Janet are “heroes”, I’m told. What a coincidence that shortly after the QE spigot was turned off on October 29, 2014, the market has gone nowhere. The speculative juices appear to be drying up. Because speculation tends to be indiscriminate, the most reliable measure of a robust willingness to speculate is the uniformity of market action across a broad range of individual stocks and security types. An overvalued market populated with speculators who still have the bit in their teeth will tend to hold up or advance further despite valuation extremes. Because of the Federal Reserve’s relentless and intentional encouragement of speculation in the half-cycle since 2009, even measures of overvalued, overbought, overbullish extremes – which had historically been followed almost invariably by market collapses in prior market cycles – were followed instead by further market advances. John Hussman, inconveniently for those of a bullish ilk, notes that market internals have deteriorated rapidly, with only a few beloved, overvalued, overhyped tech stocks holding up the market. Most stocks are already in a bear market. Corporate profits are falling. PE ratios are high. Consumer spending is anemic. The jobs growth narrative is false. Real household income is at 1989 levels. Based on history, current conditions have only been seen at major tops. I’m sure this time will be different and Cramer, along with all the highly paid Wall Street shills, will be right. Now that market internals have clearly deteriorated following overvalued, overbought, overbullish extremes, with reliable valuation measures at obscene levels and emerging economic weakness, a century of history suggests that the stock market is vulnerable to the risk of severe losses. Investors should not assume that the “support” that keeps losses relatively shallow during a drawn-out topping process will persist. There’s some truth in the old saying “the bigger the top, the steeper the drop.” Only a few points in history have seen the S&P 500 within 3% of a record high, with both overvaluation and unfavorable market internals during at least 80% of the prior 26-week period. Aside from points in recent months, the other points were major tops in 2007, 2000, 1972, 1969, and 1961. When you talk to your relatives, neighbors and coworkers they all act like they are buy and hold long term investors. They are either lying or oblivious. Someone who is 60 years old and has accumulated a significant 401k nest egg invested in stocks can not afford a 50% haircut in their retirement portfolio. Anyone with a significant amount in the stock market will have to have balls of steel to not panic as their life savings is cut in half – AGAIN. Three times in fifteen years is pretty hard to swallow. The debt markets (junk bonds) are a flashing red warning light. To not heed the warnings of the market would be foolish. Hussman couldn’t be any clearer, just as he was in 2000 and 2007. I really do implore investors who could not comfortably ride out a market collapse similar to 2000-2002 or 2007-2009, or who rely on their assets to finance near-term spending plans, to shift their risk exposure down to a level that could tolerate that outcome. Understand that while valuations have been hostile for years, and while overvalued, overbought, overbullish conditions have repeatedly emerged in the recent half-cycle without effect, the hinge that supported continued gains was a persistent willingness to speculate, as conveyed by uniformly favorable market internals. That support has dropped away. Ignore that key distinction at enormous risk. The market behavior we’ve observed in recent quarters is fully consistent with an extended top formation. With credit spreads predictably widening in successively larger spikes, that formation appears increasingly vulnerable to a steep vertical break of prior support. Robert Prechter perceptively notes that investors act in a herd like manner thinking that because the herd is still invested in the market and has not sensed danger yet, it must be safe. Investors are lazing around the waterhole like unsuspecting gazelles. This herd will be running for their lives in the near future, as danger is lurking. If you have an ounce of common sense, ability to think critically, and appreciation for risk, you should leave the herd now before the inevitable stampede. 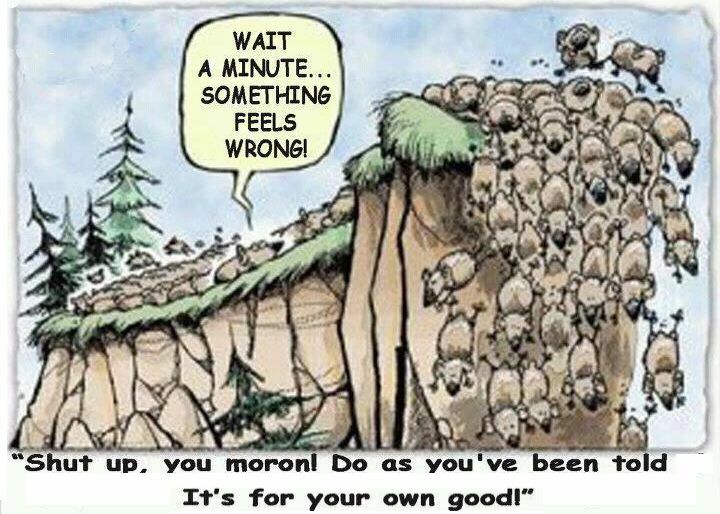 Staying with the herd as it heads for the cliff is not an effective strategy. At present, we observe a herd at the peak of a valuation cliff, where an increasing proportion of the herd is backing away. It’s increasingly urgent to dig in one’s hooves to keep from dashing over the edge. We can do little for those who insist on remaining in full gallop, imagining that sustenance awaits them ahead. After experiencing two Federal Reserve induced booms and busts in the last fifteen years, you would think people would learn. But the true lesson of history is that people never learn from the lesson of history. How did the S&P 500 trace out a total return of zero between 2000 and the end of 2011? By first losing half its value, then more than doubling, then losing more than half its value, and then doubling again. Across history, extreme valuations have invariably been followed by similar behavior – wide cyclical swings, yet only modest overall returns over the following decade. Anyone fully invested in the stock market at this point in time is delusional and mad. If they think they can sense danger before the rest of the herd and exit once the stampede starts, they are badly mistaken. Just as they were in 2000 and 2007. Now is the time to regain your senses and stop playing in this rigged Wall Street game. After years of Fed-induced yield-seeking speculation that has driven equity valuations to the second most extreme point of overvaluation in history (and the single most extreme point on the basis of median valuations), investors have somehow convinced themselves that this time will be different; that this time the market will maintain at a permanently high plateau. That belief is nothing new – it’s the same delusion that investors have held at speculative peaks across history, refusing to accept the familiar signs of danger until the equally familiar losses were conclusively in hand. The Burning Platform Click above logo for original story.